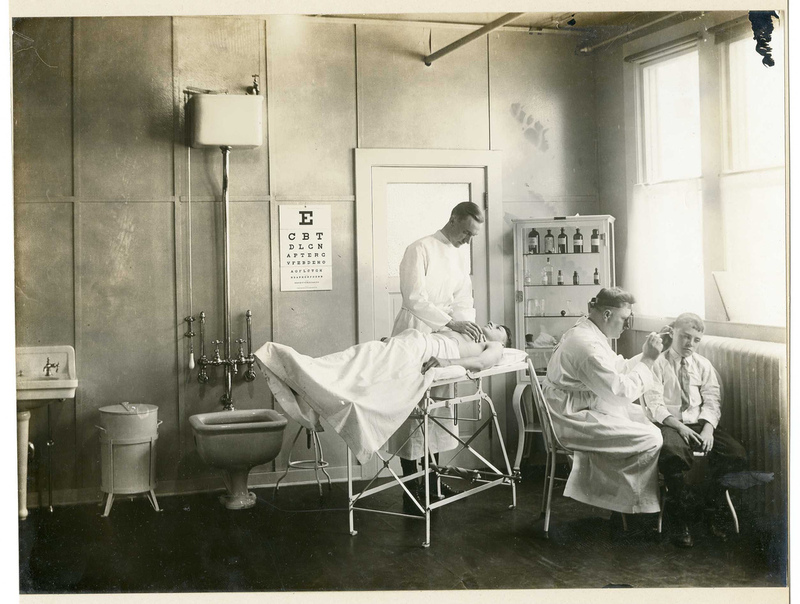 Examination room, World War 1 (Otis Historical Archives Nat'l Museum of Health & Medicine). The differences can be partly explained by the sociocultural contexts of Barcelona and Medellín. For example, students from Barcelona (where the neuroscientific model has greater influence) agreed more with a medically oriented position of psychiatry and that psychiatry is scientific, precise, and a valid branch of medicine. This lack of respect from other medical professionals, not to mention from consumer/survivor advocates, puts neuroscientists in an awkward position. We believe in neurobiological explanations for the full gamut of human behavior,2 yet we're left to defend a specialty that relies on clinical interviews and a disputed classification system. There is in fact a large and growing literature on structural and functional differences between the brains of those with and without psychiatric disorders, but these discoveries have not yet translated into reliable diagnostic tests. Biological psychiatry aims to understand mental disorders in terms of the biological function of the nervous system. By several measures it has been a tremendous success—thousands of scientific papers and hundreds of books devoted to this subject; legions of dedicated scientists and over 60 dedicated professional societies worldwide; and a profound impact on the public's perception of mental disorders. Despite these successes, it has not led to clinical tests that can be routinely used in the diagnosis and treatment of mental disorders. In the early 2000s, a series of white papers expressed hope that the advances in genetics, imaging and new technologies might lead to a biologically supported psychiatric classification and diagnostic system. But a decade later, as we stand at the threshold of a new version of the DSM, there are few biological clinical tests central to diagnosing psychiatric illnesses (other than those used to exclude physical illnesses). This article explores why this journey has been difficult for psychiatry and what can be done about it. The question of "why" revolves around the "missing gold standard" - a biologically valid concept of a specific mental illness. During the Decade of the Brain (1990-1999) there was considerable optimism that advances in neuroimaging and genetics would lead to improvements in the validity of psychiatric diagnoses. However, that didn't happen. Many of the genetic association studies in schizophrenia failed to replicate, for instance. Readers of this blog (and others) know the problems and limitations inherent in contemporary neuroimaging, no less the methods of 15-20 years ago. In the Decade after The Decade of the Brain, Dr. Thomas Insel noted that 90s-era research in biological psychiatry focused on how treatments work, rather than the causes of disease. Looking ahead, he sees new views of mental disorders as circuit disorders are one reason for renewed optimism. On the one hand, these successive editions of DSM and ICD lead to increasing psychometric precision. On the other hand, the ever increasing fractionation of mental distress into smaller and more numerous categories, without a priori biological validity, makes it harder to find specific biomedical tests that diagnose or predict the disorders. One might expect that failure to replicate the findings would induce scientists to lose interest in the given area and to move on to findings with more robust effects. Unfortunately, an initial underpowered study is often followed by another study of similar size but with a few additional measures and variables to give it some novelty and distinction. These subsequent studies usually have only modest statistical power to decisively confirm or refute the original finding, but do have sufficient multiplicity of new measures to generate some significant finding—even though not precisely the one observed in the first study—thus providing an ‘approximate replication’.26 As a result, the ‘literature’ in the field grows without decisively replicating/rejecting the precise original finding, but instead creates a penumbra of ‘P<0.05’ findings around the first. Few biological screening tests have been developed without a plausible and understandable link to the aetiology or pathophysiology of the disease—thus biological screening for most psychiatric disorders seems distant. The prospects of ‘diagnostic tests’ for DSM entities remain distant for reasons articulated above, and it seems unlikely that we will replace the 300-disorder taxonomy of the DSM-5 with an alternative biologically based classification system anytime soon. Therefore the real opportunity for psychiatry is to use the emerging advances in genetics, molecular biology, imaging and cognitive science to supplement, rather than replace, the symptom-driven diagnosis. It is often like this in the rest of medicine [e.g., asthma, arthritis]. Instead, the goal should be to create a "stratified psychiatry" of phenotypic or genotypic subtypes - although they caution that the promise of "personalized medicine" has not been obtained in other specialties either. But they point to discovery of the gene mutation resulting in overexpression of HER2 in breast cancer, and the development of monoclonal antibody treatments, as one success story. This type of stratification doesn't require a complete understanding of the etiology of breast cancer. Within psychiatry, one can view the diagnostic category of schizophrenia (for example) as a collection of symptoms or disorders that can vary across individuals (Bakker et al., 2004, 2007; Cobia et al., 2011; Hallmayer et al., 2005; Jablensky, 2006; Williams et al., 2007), despite the DSM-5 recommendation to eliminate the DSM-IV schizophrenia subtypes. ...is to define basic dimensions of functioning (such as fear circuitry or working memory) to be studied across multiple levels of analysis, from genes to neural circuits to behaviors, cutting across disorders as traditionally defined. The delay is understandable given the later start than the rest of medicine, the complexity of the brain, the nascence of neuroscientific techniques and the evolving nature of psychiatric nosology. On the other hand, the opportunity afforded by the progress in genomics and imaging combined with the computational abilities is unprecedented and could deliver useful clinical tests. These tests will identify homogenous populations for whom one could develop targeted new therapeutics thus realising a vision of a new stratified psychiatry that cuts across the traditional diagnostic boundaries while simultaneously transforming them. NIMH paylines are now at the 15th percentile for established investigators and the 18th percentile for new investigators, which is better than in recent years [and better than the anemic 7th percentile at the National Cancer Institute], so perhaps there is some reason for optimism after all. 1 For a defense of psychiatry as a profession, see the wonderful Shrink Rap blog post on Why Psychiatry is a Wonderful Medical Specialty. This is not to say that society, culture, environment, and personal experiences play no role in the manifestation of "psychopathology". 3 Dr. Kapur is the Dean of the Institute of Psychiatry at King’s College London, Dr. Phillips is the Director of the Canadian Institutes of Health Research's Institute of Neurosciences (Mental Health and Addiction), and Dr. Insel is the Director of NIMH. Fazel S, Ebmeier KP. (2009). Specialty choice in UK junior doctors: is psychiatry the least popular specialty for UK and international medical graduates? BMC Med Educ. 9:77. I'm always skeptical when it comes to the kind of reductionist approach biological psychiatry takes. That's not to say there may not be significant differences in brain structure/function or that this kind of research is useful, but rather that it's a huge assumption to think that such complex conscious states could a) be reduced to a molecular, structural or functional level and b) that such findings would apply universally. Essentially he likens such an approach to trying to categorize literature by statistically analysing books at the level of letters, punctuation and grammar. The emergent properties such as meaning can't simply be reduced to basic units from which they emerge. The same applies with mind and brain. Uhhhh...you might read 1boringoldman.com on Tom Insel's illusions. The psychogenetics approach has come up dry because there's no genetic basis for psychiatric diagnoses. Too many factors, genetic and environmental, are probably involved, and the diagnoses themselves are written in sand. Even the more "defined" psychiatric conditions, such as schizophrenia, have proven impenetrable to this approach. There's a tremendous amount of noise in brain scans, which researchers do not properly process statistically. They pretty much see what they want to see in them. It's like reading tea leaves. Then, of course, there's the problem mentioned above of linking a quasi-physiological pattern with vague diagnoses. Who knows what condition brain scanners are looking at? As for the mountain of scientific publishing supporting biological psychiatry -- the poor quality of the research is why other disciplines look down on psychiatry. Every day there's a new scandal about some pseudo-authoritative piece of cr*p.
See, for example, the current news about Paxil Study 329, with dozens of co-authors, some psychiatry's thought leaders. The Bible has a mountain of commentary written about it; would you say the volume of material demonstrates it's all true? With all due respect, you're mistaking hype generated by the newly branded "neuropsychiatric" establishment, which is seeking vast investment from governments worldwide for these shiny hi-tech initiatives to keep their incomes flowing, for actual advances in psychiatry. "During the Decade of the Brain (1990-1999) there was considerable optimism that advances in neuroimaging and genetics would lead to improvements in the validity of psychiatric diagnoses. However, that didn't happen. Many of the genetic association studies in schizophrenia failed to replicate, for instance. Readers of this blog (and others) know the problems and limitations inherent in contemporary neuroimaging, no less the methods of 15-20 years ago." I already linked to the post by Daniel Bor and to Neuroskeptic's entire archive on fMRI. I have been writing critically on neuroimaging for years... the name of this blog is The Neurocritic for a reason. I didn't bother to link to the large number of my own posts on the topic. My very next post after this one (which was up when you made this comment) is called The Dark Side of Diagnosis by Brain Scan. I've also written critically on behavioral genetics: Bad News for the Genetics of Personality. In the present post, I said that "...one can view the diagnostic category of schizophrenia (for example) as a collection of symptoms or disorders that can vary across individuals." It's also clear that Kapur et al. think DSM is a hindrance to progress, so it's not like all biological psychiatry types treat DSM like a bible. Science is empirical (based on observation and experimentation), unlike the bible. If you don't believe there is any physical basis for behavior, then what do you believe? People gets strokes or injuries to their brains, and their behavior changes. People drink and take recreational drugs, and their behavior changes. How do these things happen? Manchester Psychiatry Society - Thanks for the links. I should have included Dr. Vaughan Bell's piece in particular. "The current practice may be seriously misleading when symptoms are not explained by a known disease, and when the disease instead is held to be present because of the alleged homogeneity of symptoms. At worst, symptomatic diagnoses serve as no more than convenient names for groups of symptoms. The approach to innovation is the identification of pathogenic pathways to medically unexplained symptoms, rather than the use of symptoms to define diseases." P.S. to Altostrata - Forgot to mention the recent post of mine entitled How Much of the Neuroimaging Literature Should We Discard? Daniel Bor linked to it, and Vaughan Bell referred to it in his post A bridge over troubled waters for fMRI?. The Mind Hacks piece has answers to that question and others from two experts dedicated to improving fMRI methods, for those who are interested. Also for those who are interested, some recent research has applied machine learning algorithms to neuroimaging data in an attempt to classify groups (e.g., Orrù et al., 2012). "If you don't believe there is any physical basis for behavior, then what do you believe? People gets strokes or injuries to their brains, and their behavior changes. People drink and take recreational drugs, and their behavior changes. How do these things happen?" Of course there's a physical basis for behavior. It has to be expressed through the corporeal body, unless you have the talents of a spiritualist and can read psychic energy. Injuries to the brain or taking drugs do cause physical changes to tissue and may affect thought and behavior. However, it doesn't follow that thoughts, attitudes, memories, and emotions -- grief, for example -- cause changes in the brain that amount to physiological disfunction. Thoughts, attitudes, memories, and emotions are qualitatively different from the physical trauma of brain injury or drug-taking. Some would call them normal human functions. "Thoughts, attitudes, memories, and emotions are qualitatively different from the physical trauma of brain injury or drug-taking. Some would call them normal human functions." What about alterations in states of consciousness that are not drug induced, like during deep meditation? Or an even better example, sleep and dreaming. Record the EEG from a sleeping person and you know what phase of sleep they're in, you know when they're dreaming. Or the "runner's high" that has been associated with the release of endogenous opioids like endorphin? None of these states are imposed via injury or drugs, yet they're associated with differences in brain activity. The phenomenon of neuroplasticity is based on the premise that the brain undergoes structural and functional changes due to experience, and experience includes thoughts and memories and emotions. In the 60s and 70's Dr. Marian Diamond and colleagues showed that rats raised in enriched environments (with toys, mazes, etc.) showed increases in cortical thickness and synaptic density compared to standard-reared rats, while rats raised in impoverished enviroments showed decreases. I think we tend to take too many things for granted when talking about psychiatric disorders. -We tend to forget that the brain is a necessary but not a sufficient condition for behavior. Yes, absolutely, we need a brain to behave but that's not a sufficient condition to explain it (and of course I am not talking about, as an alternative, the slippery and unscientific concept of "mind"). -The nature of behavior and the levels of its analysis are also mixed up: No, we cannot reduce behavior to physiology, chemistry, etc. and we cannot explain behavior looking inside the body. -The medical model of behavior is circular and pseudoexplanatory in its own conception: from certain behaviors we produce a label that later will explain those behaviors. To look for clues of those labels in the brain, is to persist on this mistake. Another big issue is the uniqueness and singularity of behavior, even of course for the same person, changing at every moment. Definitely I won't expect we will ever find a biological marker for something that simply doesn't exist: the mental pathologies. There's an interesting book called "The Politics of Life Itself: Biomedicine, Power and Subjectivity in the Twenty-First Century" written by Nikolas Rose that combines the issues you are talking about here with the ones from the anti-psychiatry post. He analyzes the growing biomedical way of thinking from a perspective inspired by Foucault and the field of Science Studies, thereby avoiding the many unnuanced critical tropes of the anti-psychiatry movement. Highly recommended. If you never define what the mind is, you can never measure it, examine it, test it. You only treat a person as a black box and use statistics to justify your conclusions. But there are tests for the pathophysiologies underlying psychiatric disorders. You know them once you define the mind. One thing: the mind is not the brain. The brain is a subset of the mind. The physiologic mind does not include the spirit. There are tests for psychiatric disorders. Realize that you cannot know the tests until you determine the pathophysiology of the mental illness. A DSM-IV diagnosis is incomplete since it is missing the pathophysiology. To know them, you have to first define the mind. Defining the mind has been missing since the dawn of medicine. By this, I mean defining the physiologic mind. The big hang-up is that many people include the spirit as part of the mind. That has to be removed from the definition since it is nonscientific, nontestable. Once the mind is defined - hint, the brain is only a subset of the mind - then the tests for the mind are obvious AND NUMEROUS. My definition of the mind includes the following: everything in the body that affects thought and mental function. One quickly sees that the immune system, nervous system, endocrine system, metabolism and nutrition are parts of the mind. The gastrointestinal system is also part. My fairly comprehensive lab panel for testing the mind can run over $5,000. With it, and a history and physical, one can determine the pathophysiology contributing to a mental illness and target them with specific treatment that has results far superior to using only psychiatric medications. Again, the brain is only a part of the mind. Any attempt to limit the mind to the brain will fail in fully determining the pathology underlying any mental illness. It would be like the blind man attempting to explain how an ear of an elephant can act as the trunk. When doctors suspect someone has depression, they generally ask a number of questions and may do medical and psychological tests. These can help rule out other problems that could be causing your symptoms, pinpoint a diagnosis and also check for any related complications. These exams and tests generally include Physical exam, laboratory test and Psychological evaluation.